His grandmother wanted him to give a Christmas speech at church, but he wasn't having it. Naszir told his grandmother he didn't want to give that Christmas speech at church, but she insisted. He gave a speech alright, but it wasn't the one he was supposed to give and the Internet loved it. Naszir Ferrell, 6, was at church with his grandmother on Christmas in Oakland, Calif. and he was supposed to give a speech. He didn't want to, but was thrust upon the stage anyway. So there he was in front of the congregation and being handed a microphone. 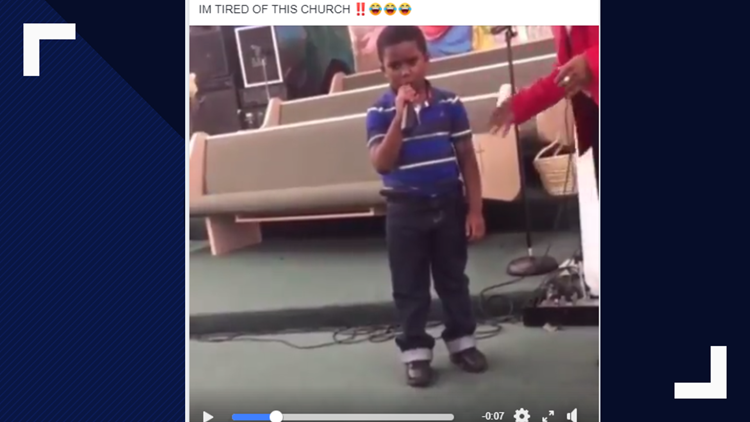 The kindergartner took the mic, said, "I'm tired of this church," handed the mic back to the emcee, and walked back to his seat with his head down. The Internet got hold of the clip and it has been viewed over a million times on YouTube, Facebook and Twitter. During the Facebook interview, Dominique Ferrell, the child's father, added “I fired on him.” (AKA – he got a spanking). "My mom’s best friend wanted him to do the speech real bad," Dominique said. "I already told my mom he doesn’t know it, so don’t force him … they ended up putting him up there any way." Turns out Naszir struck a cord. Many of the comments on social media ranged from "he needs a whoopin'" to "I wanted to do that when I was a kid, but was too scared."